From the Control Center window, select the menu "Tools > Account Connections…"
The Connection Wizard will appear. Press the "Next >" button. 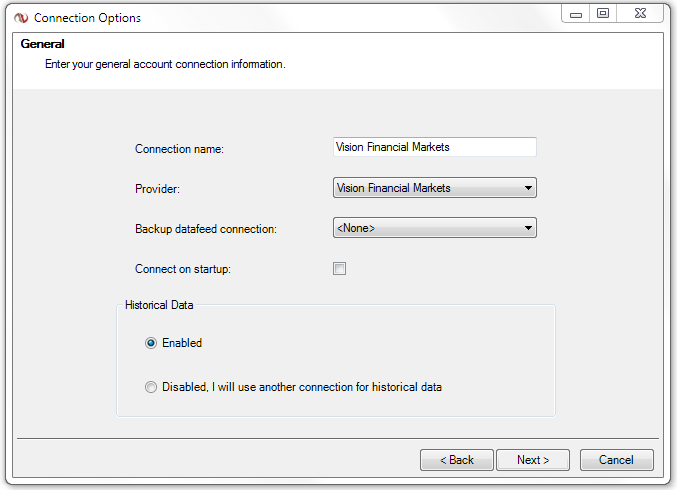 Backup data feed connection: Select your backup data feed or leave as "<None>"
As per the image below, enter your Vision Financial Markets account user name and password. Please leave the system as the default unless instructed to by NinjaTrader support. Press the "Next >" button followed by the "Finish" button to complete configuring your Vision Financial Markets account. To connect to your account, go to the NinjaTrader Control Center window, select the menu "File > Connect" and select your account. Review the information regarding Trading Technologies historical data servers below. 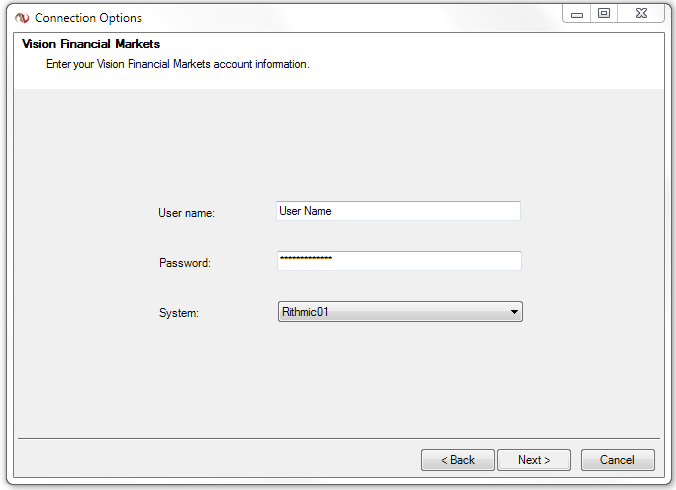 Critical: OCO (one cancels other) orders for Vision Financial Markets are locally simulated on your PC. This means that NinjaTrader must be connected to your broker in order for the OCO capability to function. If you are disconnected and one of the OCO orders are filled, the other WILL NOT be cancelled. Did you know that Vision Financial Markets does not provide index data such as TICK or TRIN? Consider supplementing your Vision Financial Markets connection with Kinetick for real time and historical index data!